They might not be huge but right now we're catching lots of nice reds using live bait under the mangroves. Shrimp are my favorites since they're easy to purchase at any bait shop but pilchards and pinfish work great, too. The local boys pictured above, Aaron, his dad Patrick, and uncle Jim, also landed a couple keeper trout and had a few nice snook hit using finger mullet but didn't land any of those so no Slam this time. The keeper red in this photo was caught on a shrimp tipped jig head sitting dead still under the treeline of Little Pine island. It was also right at high noon when the sun was getting unbearably hot and we were talking about quitting. The fish must have heard us since the bite turned on immediately. Funny how that happens. If you have a bimini top on your boat, high noon and high tide can be really productive right now. One of my anglers caught this fish a short while ago while we were tarpon fishing. This small jack crevalle clearly had a close encounter with an osprey or possibly a bald eagle and lived to tell the tale. You can easily see two deep vertical gashes on its flank as well as a puncture wound under its dorsal fin that completely penetrated both sides of the fish. Despite all this trauma, which looked surprisingly fresh, the little jack hit our tarpon fly as soon as it touched the water. After posing for this picture it swam away like nothing ever happened. Crevalles are basically the Terminators of the angling world. Standup paddleboards (SUPs) are great and if you haven't tried one yet, you should. Even if you could care less about the fitness benefits of them, they can make great fishing platforms. You can click here to read more about that. Whenever you're thinking about an SUP for fishing, stability is the first thing that should come to mind. Casting a fly rod from a surfing or touring board is like delivering newspapers from a Ferrari. It can be done but there are platforms better suited for the job. The Hooked SUP is easily one of the most stable fishing paddleboard currently on the market. Everytime I try out a new paddleboard or kayak it automatically gets the all-important Dog Test. This is done with my 45 pound mutt Maggie who can't stand being left behind on the dock. Maggie usually runs around for a few minutes before settling down and watching for evil birds and dolphins. As you can see in the photos above I managed to stay dry on the Hooked SUP with the dog on the bow. Thanks to oncoming thunderstorm I didn't get the chance to take the paddleboard out of our canal but I did manage to cast at a few rolling tarpon the next morning. It was just as stable when casting a fly rod as it was with a crazy dog so this board definitely gets my thumbs up. Stop by Florida Paddlesports to take a closer look or try one for yourself. The redfish schools in both Matlacha Pass and Pine Island Sound will become more visible as we head into August. Falling tides in the evenings are my favorite times to chase them since this also give us the best tailing conditions. From 6 to 8 PM are excellent times to be on the water and escape the heat of the day. Check the tide charts for lows that happen in this time frame and you'll almost certainly find tailers. I hit one of my favorite grass flats north of Matlacha last night with local angler Kyle Petrick and we spent two solid hours chasing reds on the fly but not hooking any. We had several good shots but if the water was just a few inches shallower there would have been a lot more tails sticking up for us. Keep an eye on the water when your chasing these falling tide reds. It's very easy to get stuck while you're focused on the fish and spending a couple hours on the flats after sunset can be miserable here in the middle of mosquito season. Update: Since I first wrote this post last year I purchased a BT3 of my own. It is hands down the best 18 foot skiff on the market. Capt. Mike Bartlett of Key West and his Beavertail BT3. Beavertail Skiffs new BT3 was introduced earlier this year and my buddy Capt. Mike Bartlett down in Key West purchased the first one. I recently spent a weekend with him chasing tarpon, bones, and permit on the flats off the Southermost City and came away more than impressed with his new ride. 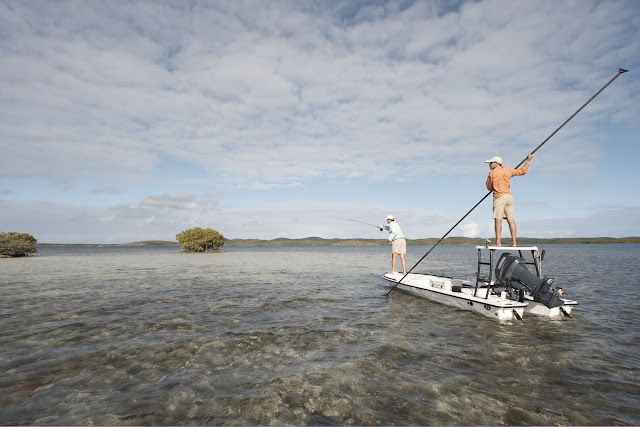 I've spent a good part of the last 20 years poling anglers across the shallows of Florida and the Caribbean on a variety of different skiffs and I can safely say that the Beavertail BT3 is easily one of the best flats boats ever built. My 2006 Beavertail B2 on the flats off Vieques, Puerto Rico. When Beavertail announced an entirely new design called the Vengeance was coming in 2009 I was eager to check it out and got the chance during a very windy week in Key West last year. I came away highly impressed. It was the smoothest and driest riding flats boat I've ever run and it poled like a dream. Now built in Palmetto, FL by Aeon Marine, the Vengeance was clearly in the same class as boats like Maverick's HPX 18 or the Hell's Bay Marquesa, but over $10,000 less than the price of those two excellent hulls. The first production Beavertail Vengeance at the Hurricane Hole Marina, Key West, FL. April, 2010. The Vengeance hull was a great start for the new Beavertail lineup and the BT3 joined it this year with a wider beam and reconfigured deck. Capt. Mike Bartlett's boat, which is rigged exclusively for the flats off Key West, was ordered with a Yamaha 90 4-stroke and a 3 blade stainless Power Tech prop. Neither Mike or myself are speed demons so we cruised from spot to spot at 4400 rpms or 33 mph. On our first day we ran 42 miles and burned less than 6 gallons of gas. This new Beavertail runs so smooth and quiet that Mike's customers will easily be able to sleep off their hangovers on their way to the first flat. Running the BT3 toward the flats. The front storage hatch and fuel tank. Mike's BT3 has a center console with an integrated cooler/passenger seat in the front and the battery underneath for excellent weight distribution. A side steering console is also available for this hull. The forward storage compartment gives access to the removable 22 gal. fuel tank and the rear storage is also huge. This aft compartment can be rigged as a tournament size release well. Mike has a custom side mounted livewell instead that is perfect for a day's worth of crabs and shrimp. The positioning of this well might seem odd at first but it allows him to quickly run between flats without rerigging his live bait each time. He can simply set a spinning rod on the deck and dunk the hooked crab or shrimp back in the well and have it ready to fish a few minutes later. Mike's custom side mounted livewell. A must have for any Keys based flat guide ordering this skiff. The console holds the battery right at the boat's center of gravity. Unlike the gusty condtions that marked my trip with the Vengeance last year, the weather was absolutely flawless for my first ride on the BT3. With just a minor breeze and slight ripple on the surface, we obviously never got a drop of water on us while underway. Poling after bonefish on a falling tide was effortless and the new Beavertail stops and spins as as easily as my old Maverick Mirage but not as quick as my current B2 with its narrower beam and much lighter 50hp 2-stroke engine. The BT3 is an honest 6" draft skiff with two anglers and a full tank of gas. Poling before the wind kicks in at Marvin Key. A quiet hull is one of the most crucial and difficult to design features of any poling skiff and the BT3 really has no slap regardless of how it's positioned in the water. It was so quiet that Mike managed to pole me within a boat's lenght of a 20 pound permit that I finally hooked with a live crab. The fish was totally unaware of our presence until it felt the hook. This was just one dozens of permit that Mike has landed in the few short months that he's owned the new boat. He's also managed to score a couple Grand Slams for his clients so far this season. A 20 pound permit caught within a boat's length of Capt. Mike's new BT3. Like myself, Capt. Mike was also a long time Maverick owner and guide. Switching brands after a decade of hard work and good service from one particular boat doesn't come easy, but the Beavertail was a serious leap forward in performance and value. You can easily purchase a BT3 rigged like Mike Bartlett's for around $10,000 less than its competitors. So what do you sacrifice when you choose to buy a Beavertail BT3 instead of a more established brand such as Maverick or Hell's Bay? Basically, nothing. The price difference in those other hulls comes from their extensive use of carbon fiber, which reduces weight but dramatically increases cost. Carbon fiber is an amazing and expensive substance that has been in the employed by skiff industry for over a decade. The current line of Beavertails do not use carbon fiber and at 675 pounds the BT3 does not suffer any significant weight penalties when compared to its competition. There are no sacrifices in utility or fit and finish either. For the last two decades, the skiff market in Florida and especially down in the Keys, has been dominated by Maverick, Hell's Bay, and Dolphin. Those three companies all make outstanding products and if you purchase one of those boats, either as a charter guide or recreational angler, your money will be well spent. Now it's time to add Beavertail to that list. Is the BT3 the best flats boat that money can buy? No. That award would have to go to the Chittum Islamorada, which at $63,000 is the Bugatti Veyron of flats boats. But if we're making sports car analogies, then the Beavertail BT3 is the Corvette ZR-1 of skiffs. A working class hero that can run right along with anything else in its class and for a lot less money. Capt. Mike Bartlett 2011 BT3. Hull #1. The forward passenger seat which covers the console cooler. The front storage compartment with access to the removable 23 gal. fuel tank. Rear storage which can also be rigged as a livewell/release well for tournament fishing. Capt. Mike's custom sidemounted livewell for crabs and shrimp. A spacious front casting deck. Since we did so well with bonefish on the previous day, catching five on fly, day two was all about getting a tarpon and a permit. Mike started off the morning by taking me to one of his go-to spots that holds baby tarpon and I hooked two on fly but lost them when they jumped in the mangroves. We spent another hour looking for laid up fish in the backcountry basins until a quick building storm chased us to right to a flat with several feeding permit. The light was fading so I didn't even try using a fly rod for these fish. I tossed a live crab at the first fish Mike pointed out to me and got it to eat just thirty feet from the boat. Twenty minutes later we had the big permit on board for the hero pictures and a quick release. A perfect end to a great couple of days with the best flats guide in Key West. If you're ever planning a trip to the island do yourself a favor and book Capt. Mike Bartlett ASAP. Permit are easily the most beautiful fish on the flats. I beat him like he owed me money. I just came back from a weekend in Key West fishing with my buddy Capt. Mike Bartlett on his fantastic new Beavertail BT3 flats skiff. The weather was excellent and we hit the bonefish jackpot. Here are some of the shots from day one. Mike's new Beavertail BT3. The first one made. Leaving Garrison Bight at sunrise. The BT3 is one of the smoothest running skiffs on the market and incredibly dry. Poling the flats near Marvin Key. Capt. Mike hooked up on and clearing his line on a small bonefish. A beautiful three pounder. Not huge but they were everywhere. The BT3 easily floats in less than 7 inches. My favorite new fly: the Avalon Crab. One for me using a Clouser Minnow. Happy Hour at Turtle Kraals.